Fleur de la Reine Cigars - Buy Premium Cigars Online From 2 Guys Cigars . Rich and bold, Flueur de la Reine flirts with a kiss of spice on each and every draw. Some may call it full flavored, but others call it just right. Fleur de la Reine is made up of a blend of Honduran and Nicaraguan filler tobaccos surrounded by a Dominican binder, Ecuadoran Sumatra is highlighted in Natural giving it a long smoky finish. What should you expect from Fleur de la Reine? The sweet woody and floral notes are balanced by orange spices and earthy notes. Kicked-up a notch or two is the deep, dark Fleur de la Reaine Maduro. Like stepping into a black tie affair, the dark, oily Maduro wrapper utilizes a U.S.A. Connecticut Broadleaf that is there to impress. Filler blend of Honduran and Nicaraguan tobaccos surrounded by a Dominican binder, go perfect not only with the wrapper but with a martini (shaken not stirred). 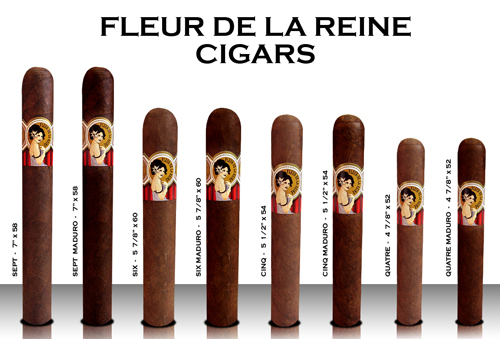 What should you expect from Fleur de la Reine Maduro? Sophisticated strength with sweet rich molasses and dark chocolate.